Matt and I often lament the fact that we can't travel full-time. Oh, if only. We just squeeze it in as we can and most of our travel involves weekend excursions. We're always looking for someplace new to visit for a few days. I've mentioned before that we usually start our search on Google Flights looking for inexpensive flights that are less than 3 hours in the air. This was an easy one. It took us longer to get to the airport than it did to fly to Guernsey. The flight from London to the Channel Island of Guernsey is less than an hour. Barely long enough to have a G&T. It's one of three British Crown Dependencies but actually closer in distance to Normandy, France than England. It's located in the English Channel and is close to the other Channel Island of Jersey. We stayed in the small town of St. Peter Port which is the capital and main port. It's a charming place with narrow roads and cobbled steps leading from the ridge down to the waterfront. Bring comfortable walking shoes. Being a British Crown Dependency means that it's not a part of the United Kingdom and is independently governed. They do depend on the the UK for protection and foreign policy. They have their own parliament, stamps and currency. You can use British pounds in Guernsey but you can't use Guernsey currency back in the UK. Some establishments will even accept euros. Even with its close proximity to France, it feels very British and English is the primary language spoken. Although up until 70 years ago, French was the official language. This small island that is only 9 miles long and 3 miles wide has an incredible history. It was occupied by German troops for most of World War II. Prior to the occupation, 80% of the children on the island were evacuated to the UK. Many never to return. About 1,000 residents were sent to German camps. With about 30 miles of coastline, Guernsey is known for it coves and beaches. We hopped on a local bus to visit a few of them. It was a lovely, relaxed weekend with gorgeous views, a welcome break from the business of London. You've probably heard of Guernsey Cows famous for their rich, golden milk. You will definitely want to sample all things dairy during your visit particularly the caramel. There isn't much better than having an ice cream by the seaside. The island is also known for its fresh local produce and seafood. There are plenty of great food options. Just watch the time. We missed the regular lunch time one day and found most everything closed from about 2pm until dinner time. The Jones when they are "hangry" are not a pretty sight, trust me. Did you know that Victor Hugo spent 15 years of his exlie in Guernsey? This is where the French poet and author completed Les Misérables. You can visit his home on the the island. We missed out this time, but would love to go back. It was too chilly to get in the water while we were there so next time we'll go when its warmer. Top tip... don't miss out on the fish & chips. The Bailiwick of Guernsey also includes several smaller islands as well as islets and rocky outcroppings. My next post will be about our short trip to one of them. 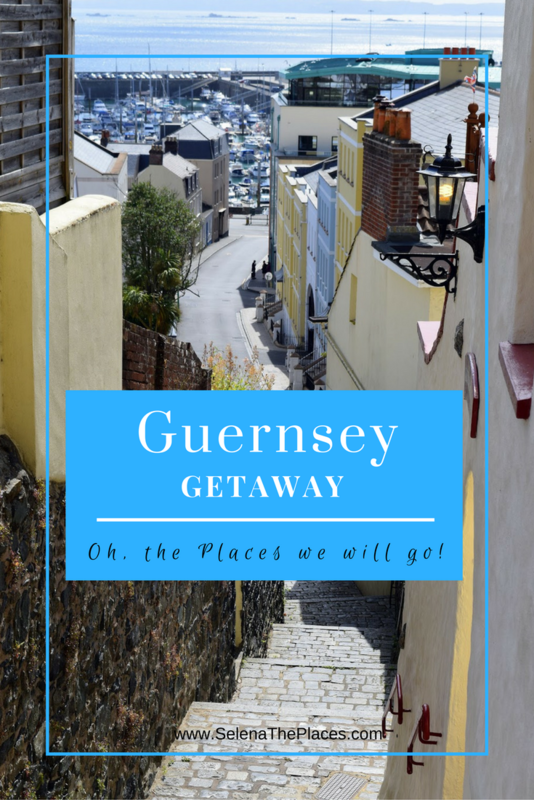 If you have some free time and are into history, do a bit of reading about Guernsey. Or better yet, plan a trip. It's an ideal weekend getaway that we both highly recommend.